1. Trouble in Berlin: Germany's DAX was trading lower after Chancellor Angela Merkel's plans to form a new government were thrown into disarray when a smaller party walked out of talks. Merkel, who was trying to form a majority government in the wake of national elections in September, now faces a series of tough choices. 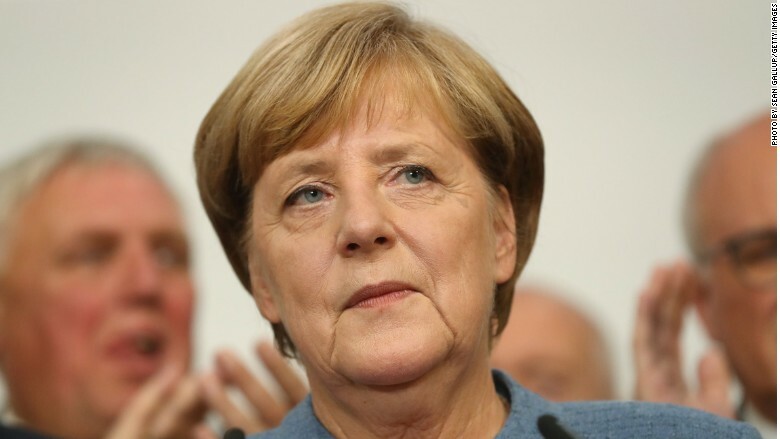 Her party could try again to form a coalition, or resort to a Merkel-led minority government. Another possibility is for snap national elections early next year. The economic impact is likely to be limited, however. "The economy is in such good shape with 2.5% growth, strong business confidence, full employment and a fiscal surplus that few major decisions need to be taken for the time being," said Holger Schmieding, chief European economist at Berenberg Bank. 2. Brexit jobs losses: The European Union will announce new host cities on Monday for two coveted agencies that are leaving Britain because of Brexit. The European Medicines Agency and the European Banking Authority, which employ roughly 1,000 people, had been based in London. It's one of the first concrete examples of organizations and jobs leaving Britain because of Brexit. 3. Markets in fear mode: The CNNMoney Fear & Greed Index has swung into "fear" territory. The gauge of investor sentiment, which tracks volatility and six other key market barometers, had been indicating "greed" for several weeks. U.S. stock futures were pointing lower. The Dow Jones industrial average closed 0.4% lower on Friday, while the S&P 500 dropped 0.3%. The Nasdaq shed 0.2%. Still, It's been at least a decade since things were going this well for Wall Street. The Nasdaq is up 26% this year, compared to a 15.5% jump for the S&P 500 and an 18% gain by the Dow. 4. Global market overview: European stocks were mostly lower in early trading. Asian markets ended mixed. U.S. oil futures edged higher to trade around $56.80 per barrel. Bitcoin has surged above $8,000, the latest in a series of milestones to be topped by the digital currency. A year ago, Bitcoin was trading at around $740. 5. Earnings and economics: Urban Outfitters (URBN) will report earnings after the closing bell. European Central Bank President Mario Draghi is speaking at 9:00 a.m. ET in Brussels. Friday -- Markets close at 1 p.m.